U.S. Secretary of State John Kerry has received the 2015 Tipperary International Peace Award in recognition of his efforts to end conflicts in several global hot spots. The south central Republic of Ireland town and county was internationally associated with war because of the song “It’s a long way to Tipperary,” according to a history of the organization. In 1983, the founding committee of the Tipperary Peace Convention felt it was time that Tipperary should be known for peace. 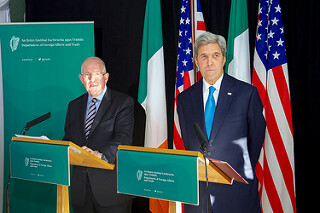 U.S. Secretary of State John Kerry and Irish Foreign Minister Charlie Flanagan address reporters at the Aherlow House Hotel in Tipperary. Kerry, who lost a 2004 bid for the U.S. presidency, joins past recipients such as former Irish President Mary McAleese; U.S. diplomat to Northern Ireland Richard Haas; Good Friday Agreement broker and former U.S. Senator George Mitchell; the late U.S. Senator Edward Kennedy; and Irish musician Bob Geldof. In remarks, Kerry said Brexit must not impact the push for peace in Northern Ireland, and also announced the expansion of a one-year internship program for Irish J1 students in America, RTÉ reported. This entry was posted in Northern Ireland, Politics and tagged Brexit, George Mitchell, Good Friday Agreement, John Kerry, Mary McAleese, Richard Haas on October 30, 2016 by admin.